To me it's the best accomodation though there's a night bar nearby with some noises at nights. However I'm easy to sleep so it's not a big problem. Just an idea to improve the staff's communication. The reception should inform customers when they check in some following: 1. Housekeeping schedule and how to deal with daily trash. 2. What customers should do to adjust the air-con. The basics of this hotel were great however there are two serious matters travelers should consider... The room number on your confirmed reservation is not necessarily the room you will get. We were booked for the 4th floor a better & quieter room location than where we ended up .... 2nd fl tiny noisy room facing the backside of dirty buildings ...on our 3rd night we were moved to the 5th floor because of the very loud music until 3 AM from a bar nearby...The hotel does provide earplugs. Clean, conveient place for a minimalistic stay. Would recommend for those who just want a cosy room but nothing more. Nice room at a good location that's a few minutes walk to major bus stops and close to tourist attractions. My only issue is with security as the door to my room(410) was really janky and had to be closed in a particular way in order to be locked. Didn't feel save leaving my belongings there so I had to take it with me. 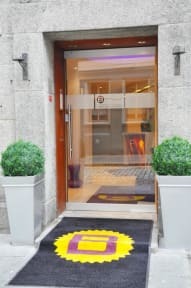 Just a heads up: this is a hotel and not a hostel so don't expect to find people hanging out in the lobby. Very good location, clean, and quiet.